Aldwarke Lock No 6 is a minor waterways place minor waterways place place on the waterways major waterways place village town city on the Sheffield and South Yorkshire Navigation (Main Line) between Swinton Junction (Junction of Dearne and Dove Canal with S&SYN.) (3 miles and 3¾ furlongs and 1 lock to the northeast) and Greasbrough Junction (Junction of the main line with the Greasbrough Canal ) (1 mile and 2¾ furlongs and 1 lock to the west). 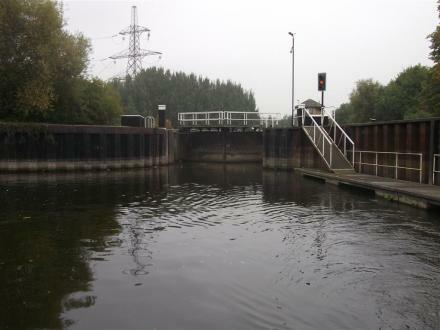 The nearest place in the direction of Swinton Junction is Aldwarke Lock Weir Exit (Channel leading to the Weir); ½ furlongs away. The nearest place in the direction of Greasbrough Junction is Aldwarke Lane Bridge; ½ furlongs away. Doncaster Road, Rotherham, S65 2DA — 1332 yards to the southwest. 1A Far Lane, Rotherham, S65 2RZ — 1060 yards to the southwest. Doncaster Rd, Rotherham, S653 — 589 yards to the east. Doncaster Rd, Rotherham, S65 3SR — 215 yards to the south. Unit 10, The Alexandra Centre, Parkgate, Rotherham, S62 6JE — 1636 yards to the west. Springwell Gardens Community Centre, Eastwood View, Rotherham, S65 1NG — 866 yards to the southwest. Rotherham, S65 4JX — 1272 yards to the east. Aldwalke Road, Rotherham, S62 6BU — 1078 yards to the northwest. Lost Boys Tattoo Lounge, Thrybergh, S654JZ — 750 yards to the east. Rotherham — 1107 yards to the southwest. 25-35 ridgeway, Rotherham, S65 3PF — 1079 yards to the south. Rotherham — 1247 yards to the south. Unit 10, Foundry Retail Park, Stoddard Way, Parkgate, Rotherham, S62 6LF — 1429 yards to the northwest. Thrybergh, Rotherham — 1436 yards to the northeast. Chesterton Rd, Eastwood Trading Estate, Rotherham, S65 1SU — 1112 yards to the west. Aldwarke — 784 yards to the west. South Dalton, East Yorkshire — 755 yards to the east. Unit 2-3, Sycamore Centre Sycamore Road, Rotherham, S65 1EN — 562 yards to the southwest. Sycamore Rd, Rotherham, S65 1EN — 292 yards to the southwest. Rotherham — 734 yards to the south. Unit 17 Aldwarke Wharf Business Park, Waddington Way, Rotherham, S65 3SH — 1125 yards to the west. Rotherham, S65 3 — 349 yards to the southeast. Mushroom Garage, Doncaster Road, Rotherham, S65 2UG — 392 yards to the south. Chesterton Road, Rotherham, S65 1SU — 1112 yards to the west. Eastwood Trading Estate, Sycamore Road, Rotherham, S65 1EN — 487 yards to the southwest. 106 Doncaster Road. Dalton, Rotherham, S65 3EW — 535 yards to the east. 54 wath Wood road, Rotherham, S65 7SN — 1193 yards to the southwest. Rotherham, 65 — 755 yards to the east. Rail Mill Way, Rotherham, S62 6JE — 1625 yards to the west. Rotherham — 746 yards to the southeast. Laudsdale Road, Rotherham, S653LG — 655 yards to the south. Sycamore Road, Rotherham, S65 1EN — 559 yards to the southwest.